August 15, 2018 was the day that the Global smartphone innovator OPPO revealed its latest product in the Philippines—the OPPO F9. The OPPO F9 has made breakthroughs in fast charging, dual rear cameras, and design. The reveal was also graced by OPPO’s celebrity endorsers Joshua Garcia and Julia Barretto and influencers Robi Domingo, Glaiza De Castro, Sanya Lopez and Gretchen Ho. Get ready to have up to 2 hours talk time with only 5 Minutes of charge! The OPPO F9 gives us the revolutionary VOOC Flash Charge Technology. A technology exclusively created by Oppo that provide a charging speed that is up to four times faster than regular charging. This means that you can charge your OPPO F9 for only 5 minutes and have 2 hour talk time. VOOC also give us 5 layers of protection when charging, from the Adapter to the port and to the interior of the phone. VOOC replaced the voltage reducing circuit with an MCU, effectively preventing the mobile phone from overheating while charging and making VOOC an ingenious, fast charging technology. You can also use your phone while keeping the speed of fast charging, which high voltage fast charge cannot do. OPPO F9 also gives us Waterdrop screen with gradient colors! The OPPO F9 comes to us with very attractive designs that will surely be enjoyed by younger generations. 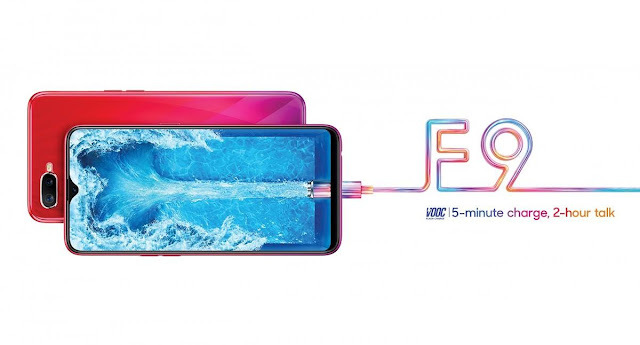 Oppo F9 gives us the waterdrop screen. Inspired by Inspired by the water droplet, it allows users to have better viewing experience with an extremely high screen-to-body ratio of 90.8%. The OPPO F9 also has an impressive 6.3-inch bezel-less screen that features a resolution of 2340x1080 and an aspect ratio of 19.5:9. Aside from the Water drop screen the Oppo F9 also gives us gradient colors. Using a special Spraying technique to achieve the refined gradient partnered with flower petal pattern in the phone’s body OPPO F9 comes in three stunning gradient color combinations of Sunrise Red, Twilight Blue and Starry Purple. Upgrade from being a Selfie Expert to Portrait Artist! OPPO F9 raises the bar for the mid-range smart phones with it 6GB RAM + 64GB storage that promises a superb performance. It also supports two sim cards slots and one 256GB storage card slot. You can also visit https://www.oppo.com/ph/smartphone-f9 for more details about the new Oppo F9.